Since 1986, Jodo Shinshu Hongwanji-ha has been promoting its Kikan Undō (trans., Core Program), for the purpose of "Aiming towards a society of Ondobo." Kikan Undō precisely consists of two campaigns: Monshintokai Undō and Dōbō Undō. The first is a lay education program encouraging everyone to listen to and sharing the Dharma. The latter focuses on social inequalities as an issue to be brought to our attention and improved, as a way for endeavoring towards the above mentioned goal. With the recent restructuring of the Hongwanji organization as an opportunity, the name, Kikan Undō, has been renamed to Ondobo Program, as a way to clarify its purpose and renew our dedication toward the realization of an Ondobo society. As a way to accentuate the purpose of the movement, the above slogan has been adopted. 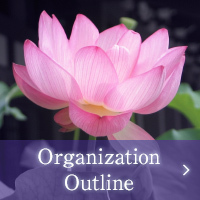 In order to advance the Ondobo Program, the way in which our goal and purpose as a religious organization is achieved is to have every sangha, temple, affiliate associations, and districts develop their own original theme and goal. "Core Project" refers to a campaign in which each sangha promotes, setting a time frame and deadline based on the theme and with concrete goals that had been selected. At the Jodo Shinshu Hongwanji-ha headquarters, every project is stipulated to be checked every three years. Since 2015 falls on the fourth year following the introduction of the Ondobo Program, the original slogan was examined and decided to be simplified. In the other words, only the latter half of the original is now used, as stated above. For concrete examples, please refer to the page of Core Projects.